Congratulations are in order for our TVC Board Member Brian Hamamoto who recently received his Masters Degree in Engineering from Northwestern University. While Brian was tackling this very challenging graduate program, he somehow made time to serve on our founding board of directors with great enthusiasm, generosity, love and creativity. He became a good friend to our Trinity Volunteers doing such things as serving with Dan Riley at the Old St. Pat’s Deck the Hall Concert and with Derek Withers on the OSP Giving Tree project among other things. He designed and launched our TVC website and coached our volunteer TVC staff on various technological challenges. The TVC family gathered to celebrate with Brian and his mom, dad and sister, – Betty, Takeshi, and Jennifer Hamamoto – while they were in Chicago for the graduation ceremony. Kudos to Derek Withers and Walter Lazard, our lead Trinity Volunteers on this special hospitality event. Thanks to Betty, Takeshi and Jen for partying with us. And, CONGRATULATIONS Brian! Many thanks to Old St. Pat’s Family Ministry Department for hosting a bi-monthly mass throughout the school year known as “The Special Friends Mass” that is designed especially for families for whom the traditional mass setting is difficult. There are always pre-mass activities that help everyone settle in and prepare while enjoying a themed craft project that becomes part of the offertory procession. Thanks to Erin Downs and Bea Cunningham for all their great work in designing and implementing this wonderful liturgy and thanks to musicians Joe, Aubrey and Jimmy for welcoming our Trinity Volunteers and their array of rhythm instruments into the choir. Fr. Jack Wall was the celebrant at the end of year mass and picnic reception on June 23rd. In his homily, he gave credit to Derek Withers for helping set the tone for the liturgy with his request for “more positive energy” during their conversation before mass. Way to go Derek! Our Trinity Volunteers are all set to help host the 29th Annual World’s Largest Block Party at Old St. Pat’s which has become over the years one of the premier summer events for young adults in Chicago. It is a party for a good cause. Proceeds support the mission and outreach activities of Old St. Pat’s. Many thanks to the following volunteers for representing TVC and helping to make Block Party 2013 a great success: Karina Leonard & Marisa Benakos; Jackie Finn & Megan Finn; Derek Withers & Chris Tauber; Susan Finn & Geri Tauber; Walter Lazard & Cindy Hunt; Steve Harhaj & Greg Hunt; Patrick Hartmann, Katie Hartmann & Jack Wilson. Let the good times roll. In keeping with the tradition begun last summer when Trinity Volunteer Dan Riley hosted his colleagues from Little Company of Mary Hospital for a Chicago White Sox game, our 2013 outing to Cellular Field is set to highlight TVC Community Impact efforts as our Trinity Volunteers host young families from the “Extraordinary League of Buddies” for a night out at the ballpark on July 22nd. 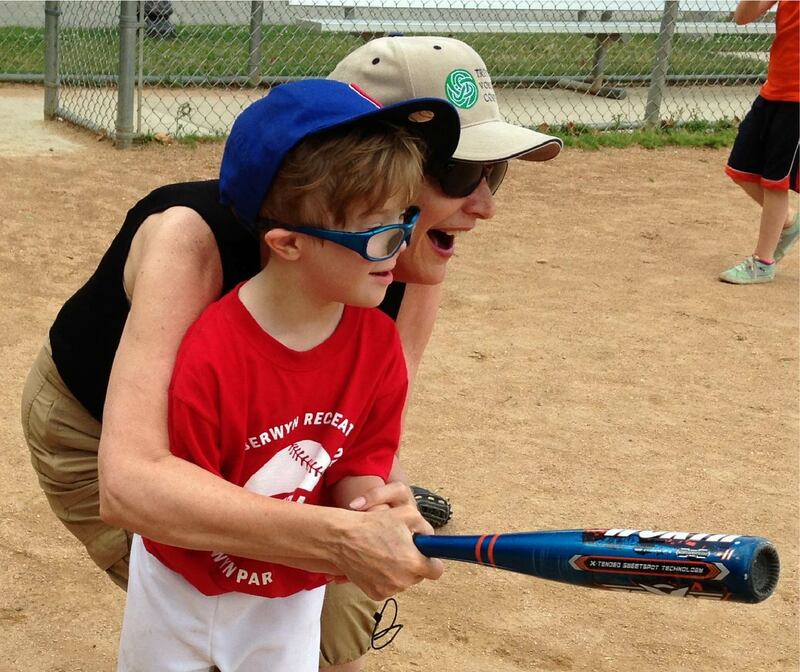 League organizer Deb Mirabelli has described the joy with which the little brothers and sisters with IDD who’ve watched their older siblings play organized baseball approach playing T-ball with a little help from their friends who assist them in batting, running the bases and just generally enjoying the classic summer fun of playing baseball. Thanks to the generosity of the Chicago White Sox organization, TVC has received a block of 100 tickets to host this event which will include all family members of the buddy league. Should be a blast!